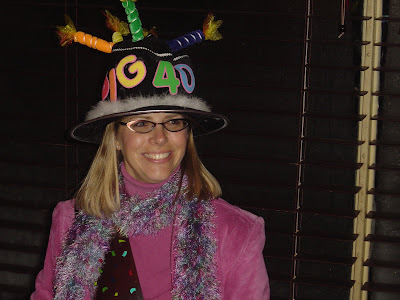 The Mom Experience: I'm 40? Who Me? Seriously? How did I get here? Last week, I turned forty. Thanks to my wonderful husband and family, I had not one, but two wonderful dinner parties. I had an early celebration before Christmas with my side of the family and then one with his family on my birthday. Even though I knew I was having special dinners to celebrate, I had no clue where or when the parties would take place. I also had a few surprises in store for me along the way. At my first party here in Indy, one of my closest friends showed up with her husband and JT (Boo's future groom). On my actual birthday, there was yet another party in Ohio with my husbands family. And to my surprise, two of my close friends (one of which is battling Breast Cancer) from my days spent living in Buckeye country showed up. I hadn't seen either of these two wonderful women in close to ten years! I was so happy to see them I cried. What can I say, I am a big sap in my old age! Turning forty was bittersweet for me. While I am not one to worry about age, it is hard not to think about it when looking back at all I've accomplished (or haven't in some cases). I remember growing up thinking forty sounded so OLD, and now that I am here I don't really feel that way. People say you are only as old as you feel, and most days I feel pretty young. My body reminds me, however subtlety, that I am not that young. I hear bones creak or joints crack when I get up and down off the floor, have to watch my weight, and things are sagging in places I can't mention. I even have plucked a few gray hairs here and there. But mentally I just don't feel OLD (except when I've forgotten where I parked or left my keys). Looking back at all I've experienced in my life, I thought it would be fun to think of forty things I've accomplished throughout my forty young years. I wish I could remember my exact age for some of these, but my forty year old memory is failing me. There are some things that are pretty obvious, and some pretty great, and other things, well. . .not so much. You get my drift. . . I am sure I am forgetting something, but that is nothing new. After all, I am FORTY. Give an old woman a break! : ) I wanted to scan some pictures taken throughout my forty years but I will have to save that for another blog. . . my forty year old body is just too tired to do it at the moment! If you know me, feel free to comment and add to my list of accomplishments. If you don't know me, feel free to comment anyway. I always like to get comments (nice ones of course) on my blog so I know someone out there is reading it! You forgot the most important. Became, and still am, a very wonderful, sweet, loving, caring daugher, wife and mother. I HAVE to comment on this. HONESTLY....since I don't know you in real life I can say this; HOLY NO WAY GIRLFRIEND...YOU LOOK LIKE YOU ARE NO MORE THAN A DAY OVER 25!!! I'm so bummed I had to miss the party!!! I had to work!!! I hope you had a great time at Bucca!! Miss you!